Today’s Home Office stories include stolen passports, the cost of UK visas and assistance for survivors of terror attacks. The Daily Mail reports on the findings of their investigation into stolen British passports. The paper says passports are stolen by criminal gangs in Western Europe, and are flown to Istanbul or Athens for sale by people smugglers. Security experts are quoted saying that owning a genuine British passport was 'like winning the lottery' for jihadis and criminals - allowing them to skip across borders undetected. 100% of passports are inspected at the border. Border Force officers are rigorously trained to prevent the holders of fraudulent documents from entering the country and between 2010 and March 2018, we denied entry to over 144,000 people. Immigration Enforcement constantly monitors and identifies emerging threats in relation to the production and supply of false travel documents, including the use of the internet to facilitate the trade in passports and identity cards. We have a range of interventions to target the criminals involved, including criminal prosecution of crime groups in the UK and overseas. Immigration Enforcement International has staff based in UK embassies and high commissions at key transit locations across the world and works closely with airlines in these locations to assist them in identifying passengers who may be travelling on fake or fraudulently obtained passports. We also work with local law enforcement partners to identify, arrest and prosecute the criminals enabling this travel. BBC Breakfast, the Sun, Mirror and Times report on calls by Survivors Against Terror for a fund to help bereaved families of victims. The British Survivors Fund would start operating within hours of an attack and provide cash to individuals and organisations. It would replace a "disjointed fundraising structure" that is inefficient and open to fraud, their report published today says. The Government is committed to providing comprehensive and swift support to victims of domestic or overseas terrorist attacks, which is why last year we set up the Victims of Terrorism Unit. Survivors of these dreadful attacks are able to access a range of financial assistance, both through the incredible efforts of the charitable sector and via the statutory Criminal Injuries Compensation Scheme. The Guardian reports that MPs and campaigners have called for urgent action to reduce Home Office fees, as the independent chief inspector of borders and immigration launches an inquiry into the charges. 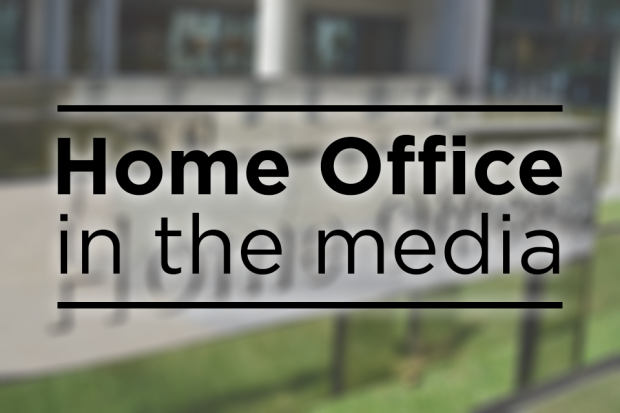 David Bolt has issued a call for evidence as he begins work on an inspection of the Home Office's fees for asylum, immigration, nationality and customs services. Mr Bolt said the report would look at the rationale for the fees, including the amounts charged. When setting fees, we also take into account the wider costs involved in running our border, immigration and citizenship system, so that those who directly benefit from it contribute to its funding. This reduces the burden on taxpayers. There are exceptions to application fees to protect the most vulnerable, such as for young people who are in the care of a local authority. Application fees are also waived where evidence provided shows that a person may be destitute, or where there are exceptional financial circumstances, and requiring a payment would result in a breach of rights under the European Convention on Human Rights (ECHR).